The PowerShot S90 is our longstanding favorite point-and-shoot, and one of its few shortcomings was that it couldn't do HD video. 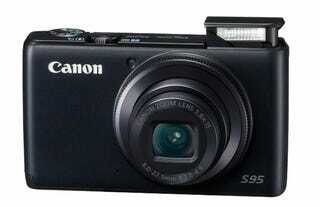 The updated S95 shoots 720p video and does it in a slightly smaller body. In addition to bringing the 720p HD video people have long been clamoring for, the S95 features an in-camera HDR mode for easily creating those vibrant, eyeball-popping shots. It's also the first PowerShot to get Canon's Hybrid IS image stabilization system. It's also a hair thinner than the S90, which was already plenty pocketable. LAKE SUCCESS, N.Y., August 19, 2010 – Further elevating the "Power" in PowerShot, Canon U.S.A., a leader in digital imaging, today announced three new high-performance PowerShot cameras - the PowerShot S95, the SD4500 IS and the SX130 IS Digital cameras. These cameras achieve photographic brilliance with Canon's HS (High Sensitivity) SYSTEM for improved low-light shooting in the S95 and SD4500 IS cameras, High Definition (HD) video recording, High Dynamic Range (HDR) in the S95 camera and a more intelligent Smart AUTO mode, among a range of others. The pro-shooter seizing the last summer sunsets with the S95 camera, the dad recording his son leaving for college on the SD4500 IS model, the aunt capturing a photo of her nephew's football team with the SX130 IS camera - these new PowerShot cameras showcase extraordinary image quality with every shot. Whether shooting a large family photo at a sunset wedding or capturing a historical monument at night, the new PowerShot Digital cameras capture clear, exceptional images in low-light settings thanks to Canon's HS SYSTEM. Canon's DIGIC 4 Image Processor combined with a 10-megapixel High Sensitivity CCD sensor in the S95 camera or a CMOS sensor in the SD4500 camera, make up Canon's HS SYSTEM. The HS SYSTEM enhances image quality and helps reduce noise at high ISO levels. It also helps to accentuate a number of hard-to-get details in images with decreased lighting. When used together, Canon's HS SYSTEM and the f/2.0 lens in the PowerShot S95 camera, enables users to capture dimly lit scenes without a flash, resulting in a more natural look for photos. "Image quality consistently remains a top priority at Canon and with each generation of PowerShot cameras, we look to build the features and technology that will best improve a customer's experience with our cameras," said Yuichi Ishizuka, executive vice president and general manager, Consumer Imaging Group, Canon U.S.A. "New features, like the Canon HS SYSTEM for enhanced low light performance and high-speed shooting, helps consumers to capture images in dimly lit settings, further increasing the beauty of a moment." When it comes to capturing a child walking for the first time or a person diving into a pool on vacation, shooting HD video is the ideal option. With Canon's legacy of delivering exceptional photos, the new PowerShot S95, SD4500 IS, and SX130 IS Digital cameras help to drive users beyond the still and encourage them to explore the world of HD video. It also helps a person to relive the experience when looking back at the images. Available on all three models, this feature offer extraordinary resolution, color and clarity to all cherished moments. Helping to heighten the quality of video, all three new PowerShot models include Miniature Effect movie mode. Available as a scene mode for shooting still photography, the Miniature Effect movie mode creates the illusion where large objects are shown in miniature proportions, providing a creative way to play back video. Combined with stereo sound, the inclusion of HD video capabilities in the PowerShot S95, SD4500 IS and SX130 IS cameras, along with outstanding still image quality, help make these models the ultimate image-capture devices. Excellent for outdoor shooting, the new S95 camera is the first Canon camera to feature the in-camera, HDR scene mode to help shooters capture the full magnitude of a scene that consists of very dark tones and bright highlights. With the use of a tripod, one push of the shutter button yields three sequential images with various exposures, and then combines them into a single optimized image within the camera. As a result, the image showcases a better range of depth and detail found in natural settings. Canon's Smart AUTO now features 28 shooting scenes to help automatically adjust to different lighting or movement levels to obtain the best image possible. Another new feature for the less-experienced shooter to utilize is the Best Image Selection option found in the SD4500 IS camera. With one click of the shutter button, the camera will shoot five sequential shots and save the best shot based on a person's movement and facial expressions. Another added bonus in the SD4500 IS camera is Handheld Night scene. Without the use of a tripod, the Handheld Night scene reduces camera shake, allowing users to shoot beautiful images within dark settings. Positioned to become another photography-fan favorite, the new PowerShot S95 camera, sibling of the popular PowerShot S90 camera, has been enhanced with 720p HD video capability and in-camera HDR scene mode. For macro-photography enthusiasts, Canon has built its Hybrid IS technology into the PowerShot S95 camera to compensate for angular and shift camera shake, making it the first PowerShot model to feature Hybrid IS technology. The camera also sports a 3.8x optical zoom and an f/2.0 lens that opens up to 28mm wide with Canon's Optical Image Stabilization technology, giving consumers a great, wide-angle lens with excellent focus. Another feature is the manual control ring on the front of the camera. For the advanced amateur shooters, the control ring allows the shooter to access manual control options and RAW shooting capabilities, allowing for more photographic creativity. Helping to deliver exquisite image quality with its advanced features, the SD4500 IS model has a 10x optical zoom with Optical Image Stabilization, providing the power to shoot distant subjects with sharp precision and details. A great tool for shooting sports, the camera also features Full 1080p HD video mode, a first for a Digital ELPH model. In addition to its HD video functionality, the camera can also shoots in Dynamic IS mode. While walking through the park on a summer day, the Dynamic IS mode, located in the camera's continuous AUTO mode, helps stabilize video capture while the photographer is in motion, further improving the clarity of HD video. The SD4500 IS camera also consists of a Super Slow Motion Video Mode, capable of capturing a subject at 240 frames-per-second (fps) and shoots video in Smart AUTO. Consistent in delivering excellent image quality, the camera also has a high-speed burst mode of up to 8.4 fps. Adhering to the design quality of an ELPH camera, the new SD4500 IS camera, available in brown, has a slim, body type, elegant curves, and strong aesthetic features. With the mix of advanced functionality and style, the SD4500 IS camera attracts all levels of users with a plethora of great features. Experience advanced features and extreme telephoto capabilities with Canon's latest, ultra-zoom digital camera- the new PowerShot SX130 IS Digital camera. The new PowerShot SX130 IS camera has a 3.0-inch LCD screen and a 12x optical zoom lens with Canon's Optical Image Stabilization technology, helping to achieve brilliant images when capturing distant objects. Continuing to serve its dual functionality, the SX130 IS camera also shoots 720p HD video with stereo sound for outstanding video quality and features Miniature Effect movie mode, adding a more creative look to any user's video capture. Further igniting a photographer's artistic nature within still photography, the SX130 IS camera encompasses four creative modes- Miniature, Fisheye, Poster, and Super Vivid, making it the first model in its series to offer these four modes. Canon U.S.A., Inc., is a leading provider of consumer, business-to-business, and industrial digital imaging solutions. Its parent company, Canon Inc. (NYSE:CAJ), a top patent holder of technology, ranked fourth overall in the U.S. in 2009+, with global revenues of US $35 billion, is listed as number six in the computer industry on Fortune Magazine's World's Most Admired Companies 2010 list, and is on the 2009 BusinessWeek list of "100 Best Global Brands." Canon U.S.A. is committed to the highest levels of customer satisfaction and loyalty, providing 100 percent U.S.-based consumer service and support for all of the products it distributes. At Canon, we care because caring is essential to living together in harmony. Founded upon a corporate philosophy of Kyosei – "all people, regardless of race, religion or culture, harmoniously living and working together into the future" – Canon U.S.A. supports a number of social, youth, educational and other programs, including environmental and recycling initiatives. Additional information about these programs can be found at www.usa.canon.com/kyosei. To keep apprised of the latest news from Canon U.S.A., sign up for the Company's RSS news feed by visiting www.usa.canon.com/rss.